Call us on +44 (0)1367 860493 or email harps@morleyharps.com for availability of this harp. 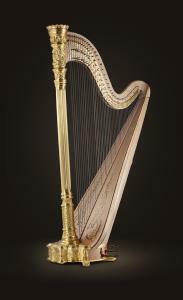 Created by Lyon & Healy in 1890, this intricate harp is symbolic of the Victorian era during which it was made. The Style 23 has become the most recognized harp in the world and showcases the woodworking artistry of the Lyon & Healy craftspeople. The highly embellished floral carving at the crown, top of the column, base and feet, is coupled with a fleur de lis pattern at the bottom of the column – both notable features of the time. The carving of the Style 23 Gold is accented with 23+ karat hand-gilding. A complimentary sweeping floral decoration accents the extended soundboard. Copyright © 2006-2019 Clive Morley Harps.